Back RX is a 15-minute-a-day yoga and Pilates program to end low back pain. It’s easy to use with three levels of difficulty. Written by a sport medicine specialist at the Hospital for Special Surgery who also serves as a professor at Cornell University Medical Center in Manhattan, the book is guided by a firm understanding of how the body works. And you don’t need to be a yogi or a dancer in order to perform the exercises. Breathing is the key component, and by virture of the fact that you’re reading this now, I trust you know how to breathe. 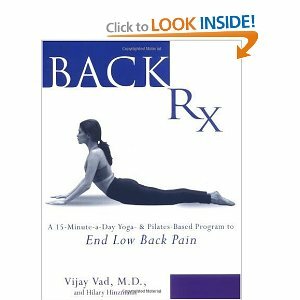 I have tried chiropractic, acupuncture, general exercise and walking, and I have to say that I experienced more pain relief in my lower back by following the advice in this book for two weeks than I did from any other practice. If you have back pain, try it now. It can’t hurt; it can only help. Chiropractors are specially trained to perform hands on manipulation using a high velocity, short lever approach that is applied to the problem areas of the spine that are misaligned or fixated. Some chiropractors utilize special adjusting instruments to do the same. The main goals are to restore normal alignment, reduce nerve irritation, improve motion and reduce stress off of the surrounding soft tissue. Spinal manipulation is otherwise known as a chiropractic adjustment. Several research studies support the use of chiropractic care for the treatment of low back pain. Several leading authorities and published guidelines recommend chiropractic care to be included in the early stages of care for low back pain. In addition to spinal manipulation, many chiropractors also offer other beneficial healthcare services. Physical therapy modalities are often utilized by chiropractors to help heal injured soft tissue which is common with spinal problems and to reduce inflammation. Some of these might include electric stimulation, ultrasound, traction and cold laser therapy.